Early Career: Stevenson attended a country school (seven years of three-month school terms), then went into business as a teenager hauling freight between Junction and Brady. Starting as a janitor at a Junction bank, he became a bookkeeper and cashier and studied law at night. As a young man he was involved with many small businesses in Kimble County, then served as county attorney and county judge. He entered the Texas House of Representatives in 1928 and was elected speaker of the House in 1933 and lieutenant governor in 1938. He became governor when W. Lee O'Daniel resigned to become a U.S. senator. He was overwhelmingly reelected, and his term as governor was the longest of Texas governor up to that time. Accomplishments: Stevenson concerned himself with soil conservation, expansion of and permanent financing for a state highway system, expansion of the University of Texas, and increases in teacher's salaries. He emphasized conservative fiscal policies and converted the state's deficit into a surplus by the time he left office. 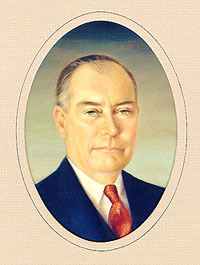 Later years: Stevenson became the center of national attention during his race for the U.S. Senate in 1948, in which he ran against Congressman Lyndon Baines Johnson. The election was the closest senatorial race in the nation's history. Stevenson appeared to be the winner when an amended return was filed from Jim Wells County giving Johnson enough to win by 87 votes. Stevenson contested the election all the way to the United States Supreme Court. He took his defeat bitterly and retired from public life. He died on June 28, 1975.